Its latest surge follows unexpected levels of popularity among Japanese audiences - grossing $144m (£110m). Bohemian Rhapsody charts the rise of Queen and the life of its lead singer Freddie Mercury - played by Rami Malek - through the band's music. Screen International's box office expert Charles Gant told BBC News the film's takings since its initial November release represent a "phenomenal outcome." The ongoing success of Bohemian Rhapsody lies in Queen being a "beloved act" whose "songs have really endured," said Gant. 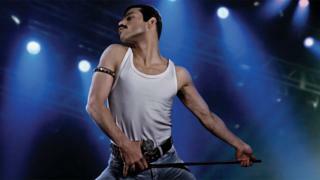 "On top of that, Freddie Mercury was a really charismatic person and performer." The film follows the singer's journeys as he finds acceptance in both his sexuality and confidence on stage - concluding at the band's iconic Live Aid performance. "Story is conflict, screenwriters always tell us, and there was a strong dramatic conflict at the centre of Freddie's life, as he strove for self-acceptance, and to reconcile the 'Freddies' he presented to his family and the world with the real person. "In other words, there is a compellingly dramatic story to tell," Gant added. Bohemian Rhapsody is now Fox's fourth-biggest title behind Avatar, Titanic, and Star Wars: Episode I - The Phantom Menace. Overseas, it is the studio's fifth-best release to date. The film's figures reflect "good word-of-mouth," he says. "Strong marketing can open a film; after that, the verdict of audiences is what sustains you."